Lindos Blu Luxury Hotel & Suites is located in the beautiful Vlycha Bay overlooking the Aegean Sea. This all-inclusive adult-only hotel is a perfect getaway for honeymooners, couples, groups and individuals. Featuring two outdoor swimming pools and a private beach, the hotel is nothing short of a beach paradise. 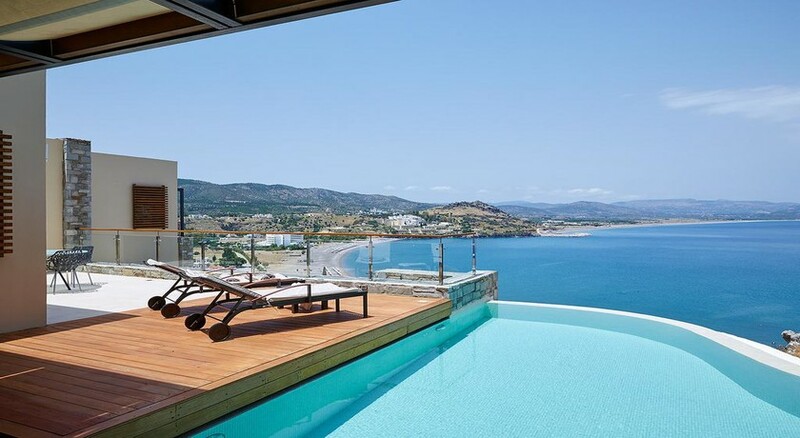 The rooms, suites, villas and maisonettes offer spectacular views of the sea. All the accommodations come with the necessary amenities required by the modern day traveller. The establishment features two restaurants, a lounge bar, a pool bar and a sun terrace, serving delicious food. Within the hotel complex, there’s tennis court, and a spa that offers a wide range of massages and therapies. 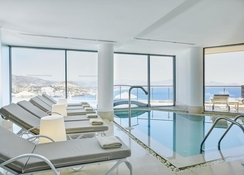 Situated downhill to the beach with a tantalising view of Aegean Sea, Lindos Blu Luxury Hotel & Suites is about 50km from Rhodes International Airport and Mandraki harbour (if you prefer to take waterways). The Vlycha beach is only 1.4km from the hotel. Lindos town is 6.1km, while Rhodes city is about 35km. Lindos offers a lot of fascinating historical places such as Captain’s Houses, Ruins of Acropolis, Kleoboulous's tomb and the Church of Assumption which you would like to take a look at. Accommodations at the Lindos Blu Luxury Hotel & Suites are available in five categories: double guestroom, junior suite, double room with shared pool, junior suite with shared pool, deluxe room, villa and maisonettes. All rooms and suites are fitted with MP3 docking stations, safe box, DVD player, air conditioning, mini bar, coffee maker, private bathroom with amenities, free Wi-Fi internet and satellite TV. A few features are available on request (and may be at an extra cost) such as HDTV, plasma TV and soundproof rooms. 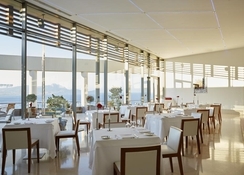 Five Senses Art Kouzina offers unobstructed views of the sea and serves up delicious Greek cuisine. 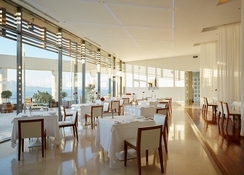 Smeraldo Mediterranean an a la carte restaurant serves breakfast, lunch and dinner. 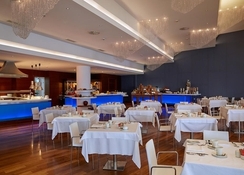 Daytime snacks can also be enjoyed from the restaurant with a drink from the Luna Rossa Lounge Bar. The bar offers vintage wines as well as cocktails, and occasionally arranges live music program for its guests. This property features two outdoor pools out of which one carries hot water. Both the pools provide adequate number of sun lounges and parasols. In addition, steam and sauna, Jacuzzi and spa, massage, body treatment and a gym fitted with modern machineries also add to the list of activities you would find on site.